Here’s a wonderful photo of Leonard and Bill with writer Harlan Ellison (The City on the Edge 0f Forever). From the set design, I’m guessing it was taken during the filming of Mudd’s Women. 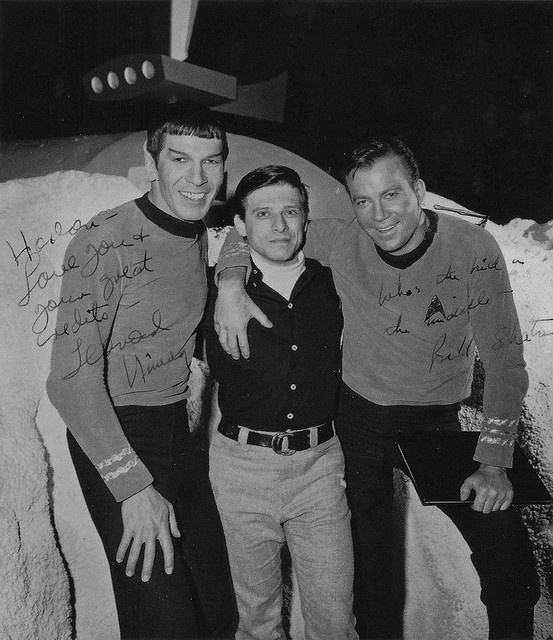 Nimoy and Shatner’s autographs are so very typical of their personalities! lol. I bet they had a great time! I’ve also see a version of this photo edited to appeal to all the ‘slash’ fans out there-with Harlan missing and L & N side hugging! Can’t find a link but you get it.